In the late 1860’s, a French scientist brought the gypsy moth to Massachusetts from Europe in the hopes of breeding disease-resistant genes into silkworms to improve and expand the silk industry (Liebhold, 2003). 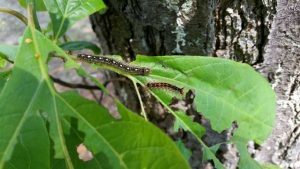 Due to his incompetence, a couple of his gypsy moth subjects made their way into the New England forest and found that they could live, breed, and thrive there. The carelessness of one scientist resulted in a gypsy moth invasion that persisted over the last hundred years and encompasses various ecosystems throughout the U.S. and Canada. Lymantria dispar dispar, known as the gypsy moth, is an invasive species that acts as a major pest of hardwood trees, particularly the dominant oak and aspen (Liebhold, 2003). As an example, a red oak that lies at the entrance of Quabbin Park in Belchertown, MA has been taken down due to it being mostly dead from gypsy moth defoliation (Miner, 2018). Iconic trees in parks around the country are not spared from the damage of gypsy moths and once enough damage sets in the trees are lost from the community. Not only does the gypsy moth cause an an aesthetic decline among these once beautiful hardwood trees, but they also play the role of the small beginning in a larger catalyst effect. They cause severe defoliation among the trees they feed on and cause harm to native species as well. One scientists economic greed and thoughtless actions have resulted in ecological destruction that has lasted and will continue to last well beyond his lifetime.